Neelima realized the importance of monitoring and evaluation (M&E) to drive good decisions. If M&E information was accessible, it could be presented to decision makers in a way that they could learn from it and use it to drive good decisions. Data when presented simply can have a transformational impact in driving the right decisions. Under Neelima’s leadership QED won its first contract as a prime contractor with the Federal Government in 1999. QED’s on-going work for the federal government has been instrumental in driving US Government policy in M&E and adaptive management ever since, with QED being recognized as one of the preeminent thought leaders in the space. Neelima continues to be passionate in making M&E insightful and understandable and finding ways to introduce technology in the delivery of new M&E solutions. 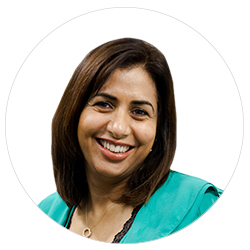 Neelima serves as CEO of the company she founded in the basement of her family home, rising to the boardroom of a multi-national corporation that works with leading government agencies, organizations and global corporations in analyzing and interpreting data to improve effectiveness and efficiency. As QED enters its third decade, Neelima is committed to leading the next wave of transformation in the MEL space, bringing new technology and innovation to the discipline by expanding the practice area within the company. Passionate about the growing fields of impact investing and social entrepreneurship, Neelima mentors budding entrepreneurs and business owners around the world, sharing the experiences of her career with those just beginning their own. Neelima holds a Master of Arts in Public Policy. She is also a regular speaker at conferences and events, sharing her insight into the importance of harnessing data to make better programming decisions, which at the end of the day, is critical to transforming and saving lives in developing countries around the world.